The Lafuma Vital Chair brings together the functionality of a medical grade healthcare recliner with the portability and comfort of zero gravity position (ZGR). This indoor zero gravity reclining chair is designed with a padded seat cushion that is antibacterial, waterproof, fireproof, and easy to clean. The Vital ZGR Chair is ideal for kangaroo mother care. The adjustable reclining positions maximize comfort during skin-to-skin contact between mother and baby, even after returning home from the hospital stay. The ergonomic backrest and position stabilizer allow the mother and baby to rest comfortably at an optimal angle ideal for relieving back pressure, improving blood circulation, and better breathing. A study conducted at a Neonatal Unit in Montreal has shown that when zero gravity recliners are used for kangaroo mother care, instead of traditional chairs or rockers, newborns benefit from 50% longer and 30% more frequent skin-to-skin contact sessions and mothers benefit from increased comfort. In addition to kangaroo care, zero gravity chair will also help those looking to relieve symptoms associated with digestive or respiratory conditions, back pain, pregnancy, and post-surgery. 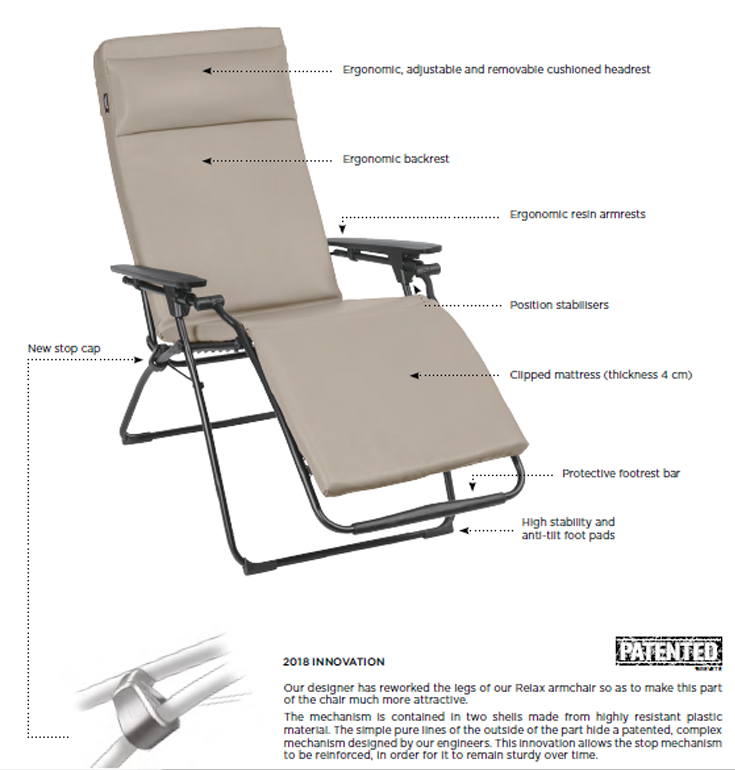 Vital chair reclines to a zero-gravity position where legs and torso are at a 127 degree angle. This comfortable position can help those with varicose veins and related pain. Elevating your legs in this chair will help you experience immediate relief. Similar to Reflexology chairs and Hypnotherapy chairs, Vital chair allows users to relax in zero gravity comfort while practitioners perform services. Also, Vital chair is portable and its padded seat cushion can be easily cleaned after each use for improved hygiene. • Easy entry and exit of the seat thanks to fixed armrests. • Position adjustment with stabiliser. • Excellent ergonomics by ensuring a better spread of the body’s weight. Better back support. • Improved comfort and firmer support. • Easy to use with very quick and simple assembly/dismantling of the canvas. • Excellent functional properties ensuring a long life-span of the product. • A high level of strength, yet still very light. • Powder coated finish. Excellent UV resistance. Click the button below to add the Lafuma Vital Chair - ZGR Plus Healthcare Recliner to your wish list.